In this post I’m going to write a java program where user can give the input which is going to be multiplied and user can also give the range as a input. 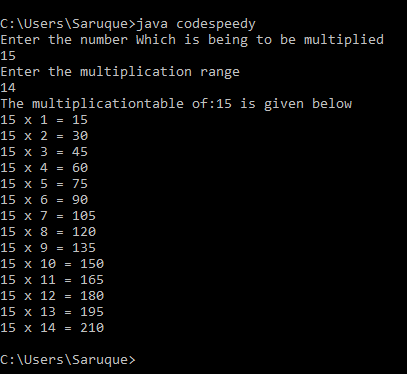 That means create a multiplication table in Java. the output will look like this . We have taken two inputs from the user here…. one is stored in a and another one is stored in b by scanner. variable “a” is used here to let program know which number we are going to be multiplied in a given range and “b” is used to give the value of range. For example I have taken 15 as a and 14 as b.
so when we run the program..
for this line lets see what happens in the very first loop. and the loop will be executed until we reach the final range.